Now that spring is showing us some signs that it just might stay awhile, have you ever wondered how birds know – sometimes before we do – that the weather is warming up and it’s okay to hang around? My writer, scrapbooking, and nature loving friend Shiela Fuller is back with a very interesting post about Ospreys that sheds some light on that question. 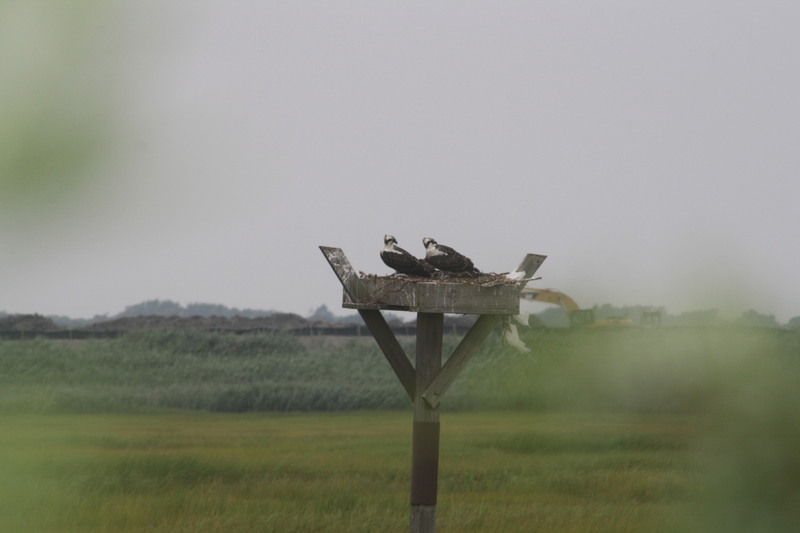 Each year since May 2012, wildlife biologists have been studying the migratory track of two adult ospreys from the Jamaica Bay Wildlife Refuge in Queens, New York to their wintering site in South America. Queens is the easternmost of five New York City boroughs and the second most populated. The main goal of the project was to gain public awareness of the refuge and cultivate interest in the inhabitants that live there. The first osprey outfitted with a transmitter was Coley. During the summer of 2012 his movements were monitored 12 hours a day. He began his winter migration and headed south on September 10th, 2012. Seventeen days and 2600 miles later, Coley arrived at his winter home, Columbia, South America. On May 5, 2013, Coley began his round trip back to Queens, NY and he arrived in 15 days and 7 hours. 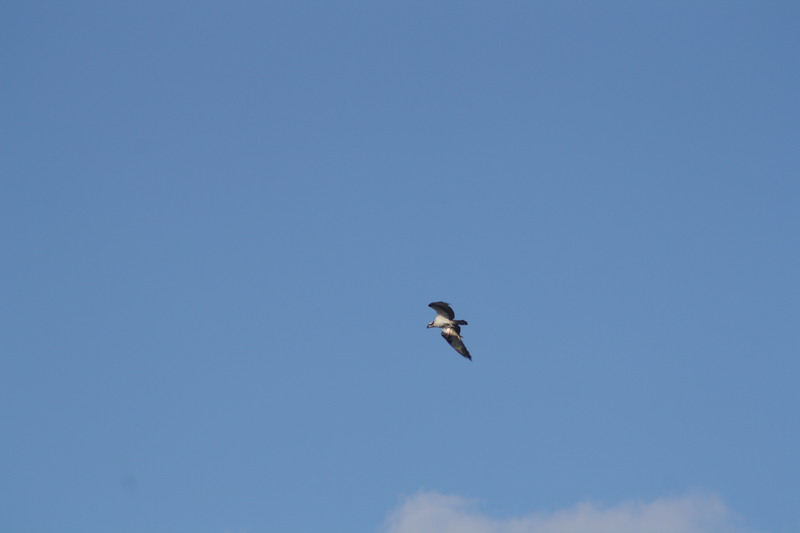 Later in the month, Coley’s transmitter was removed and placed on another male osprey, Coley 2. Scientists would now track the movements of this bird. During the summer, Coley 2 spent a lot of time perched with his mate after nest failure. Staying close to the nest assured the pair that it would still be their home the following spring. Weather can affect migration and when Coley 2 left New York on September 2, 2013, he was headed into some pretty serious thunderstorms. He only traveled 44 miles and settled in Trenton, New Jersey for the first night of his trip. Coley 2 continued onward and made remarkable time considering his damp start. He arrived at his winter home, Lake Valencia in Venezuela, South America on September 17, 2013. While at Lake Valencia, Coley 2 will spend his time fishing, eating, and resting until his internal signal tells him it is time to return to the nesting area. What inspires birds to migrate north or south and how do they find their way? There are only scientific speculations but some say it is hormonal changes and/or the changes in the length of day/night hours that motivate migration. Navigation is a bit trickier to understand but some say birds rely on the position of the sun, those that travel at night rely on the North Star, and some scientists say that birds use landmarks to help them find their way just as humans do. That doesn’t explain a bird’s first migration. How would they know the landmarks if they never traveled before? Scientists had been monitoring Coley 2 at Lake Valencia and were happy to note that he must know the weather is bad in the northeastern US and stayed a little longer at his warm winter home but on Sunday, March 16, 2014, just a few days ago, Coley 2 left and was traveling at a remarkable 250 miles per day. Scientists are not monitoring Coley 1, but he and his female partner were spotted on their platform nest in Jamaica Bay on March 23, 2014. Will Coley 2 be far behind? Will his female partner arrive before he does? Follow Coley 2 on his magnificent journey and you can even predict when he might arrive at his summer home: http://www.jamaicabayosprey.org. Rock Tumbling a Picture Book:The Art of Revision. Today’s Post comes from my writing friend and soon to be published Picture Book Author Beth Ferry, who writes about the revision process she goes through for her picture books. I can clearly remember the summer I was given a rock tumbler. It was a gift of transformation. A gift of possibility. It was THE gift of the 70s. I can remember carefully placing those dusty rocks into the chamber, knowing that very soon I would be the proud owner of sparkling, gleaming gemstones. I remember how LOUD it was and how LONG it took. I also remember being amazed by what emerged. Many, many years later, the idea of the rock tumbler came back to me. In so many ways, writing is a lot like tumbling rocks. In addition to rocks and water, rock tumbling requires sand-sized particles of silicon carbide, also known as GRIT. Grit is tough and hard and unrelenting. It wears down the rocks, smooths them and rounds them. GRIT is a crucial part of WRITING. My first step is to unearth the story, get it down, write it! Ideas truly come from everywhere, but I mostly get my inspiration from words that I like. Some words just speak to me louder than others and an idea will often spark from that one particular word. My FIRST DRAFT is very much like a lumpy brown rock. It usually isn’t pretty, but it has potential. With a little work, I know I can expose the beauty within. During the FIRST DRAFT, I shape my story. I explore the plot, characters and conflict. I don’t worry about each word, just the essence of the story. Am I telling the story I planned to tell? Does it have an arc? Is the ending satisfying? Just the first draft alone takes many, many rewrites. Once I’m happy with the overall shape of my story, I drop it into the tumbler. Here’s where it gets LOUD. I read the story out loud. Again and again and again. I read it inside; I read it outside; I read it to my dog and to my family. Nothing is more useful that hearing my words out in the air. This is where I hear my mistakes, the slow parts, and the beautiful parts. What goes on inside my head is very different than what goes on outside of it so it is crucial to read your story out loud. Once my story is tumbling around in my head and in decent shape, it’s time for the BIG PICTURE EDIT. This is truly the hardest part. This is where I ask myself who will be reading this story? Who will be buying it? Is it too much like another story? It’s basically a question of worth. Will my story add to the greater good? Will it make the reader think, laugh, cry or clamor for more? Does my story belong out in the world and will it enhance not only the shelf, but the reader him/herself? Is it a gem? Hopefully I’ve answered yes to these questions and, if so, I move onto the SMALL PICTURE EDIT. The SMALL PICTURE EDIT may be the longest process. I might rewrite a story 12 times or 83 times. When I think about how many times the rock revolves in the tumbler, I know that I might possibly make hundreds of tweaks to any one story. Tweaks that involve line editing, using my thesaurus, and more reading out loud. I check for clear, concise sentences, for matching tenses and consistent POV. I ask myself if the resolution is not only satisfying, but hopefully unexpected or fun as well. Does my story make me happy? Is my word count satisfactory? Rocks lose approximately 30% of their size during tumbling, so I am not afraid to cut, cut, cut. I try to lose as many words as I can in this step of editing. This is also when I share with my critique group. A critique group is essential. There is no better support than other committed writers writing the same genre, and no better eyes to point out not only your mistakes, but your successes as well. Whether in-person or on-line, a critique group adds a valuable layer to your editing process. Finally, when I feel that my story has a nice shine, I put it away. Yes, indeed! It’s like walking away from that rock tumbler and letting it churn for weeks. As eager as I am to peer into that barrel and see my shining gems, I don’t. I need some distance so that I will have fresh eyes when I read it again. This is the part of the process where I work on another story. Remember, besides water and GRIT, a rock tumbler needs to be filled with other rocks or the process won’t work. I always have more that one story tumbling around. I work on those. Then after a week or two, I take the story back out and read it OUT LOUD with fresh eyes. This is the polishing step. I can usually identify the problem spots right away at this point. I work on those. Then if I love the story as much as I did before I walked away from it, I know I am done. Finished. My story is shaped, sanded and polished. It is ready to meet the world, a gleaming gem full of possibility. 1. Keep things simple. You don’t have to dig up your entire yard to reap the benefits of gardening. Start with a small raised bed or a large container or two. 2. 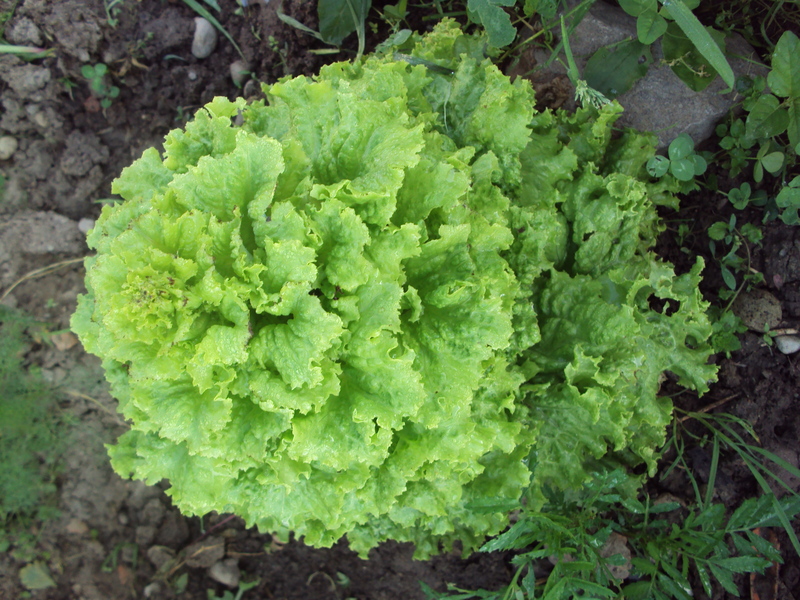 Try fast growing crops such as lettuces, chives, radishes, spinach, herbs and the like. 3. Let your kids have a say in what they grow. If you’re trying to encourage them to eat more veggies, let them pick the ones they would like to try. I’ll bet they get excited about tasting them once they see them pop up in the garden. 4. Make weeding and watering part of the daily routine. That way you will keep the unwanted weeds under control and ensure that the seeds get a fair chance at sprouting. Always weed when soil is moist to avoid damaging roots of tender plants. 5. Check out the library for gardening books for beginners and children. Make it fun! See whose seeds sprout first, whose veggies grow fastest, are tallest, etc. When it comes time to harvest, let the kids plan a meal using the fruits – and veggies – they grew. Gardening with Children from the BBC This site tells you how to compost, cultivate earth worms, use beneficial insects for pollination and has many child-friendly activities related to gardening and the outdoors. 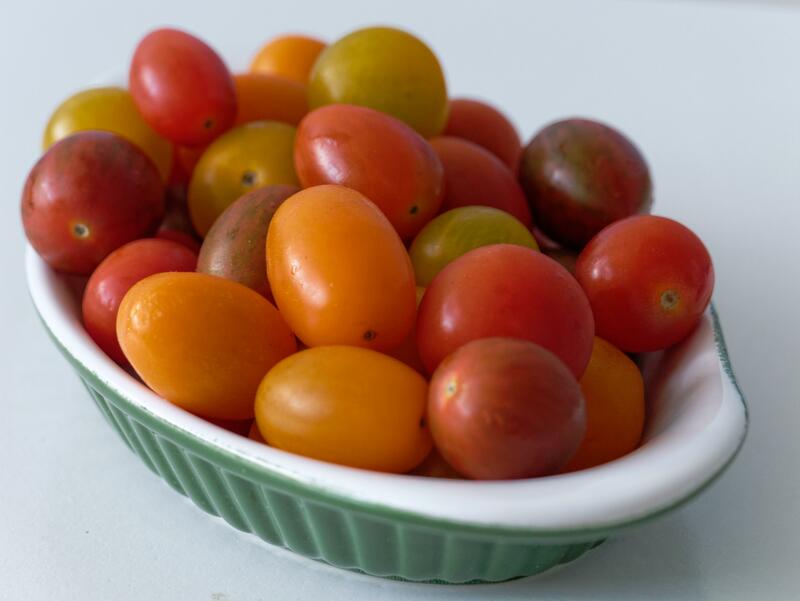 Happy Growing – and eating! 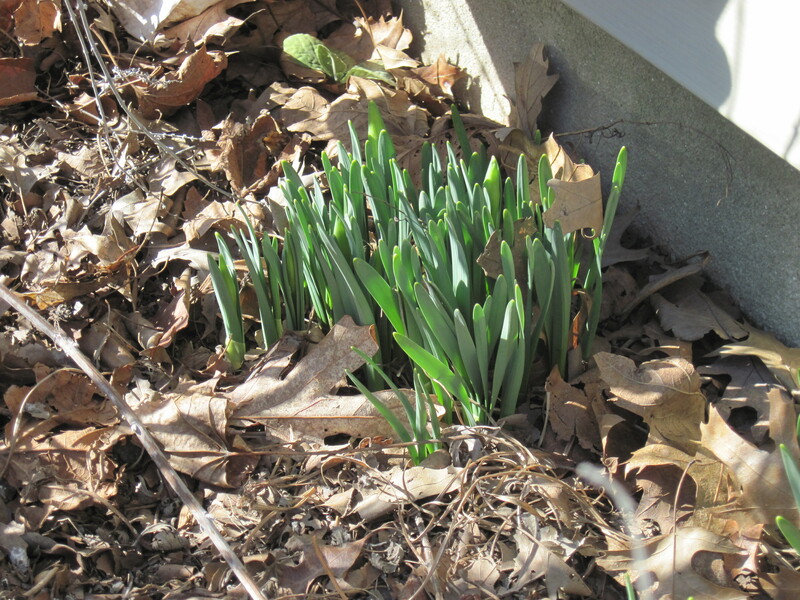 As I stepped outside this morning, I was greeted by a sure sign of spring: Daffodils. Check out this photo from one of my flower beds. Happy Planting and Happy Spring! MIXED GREENS SALAD: 1. 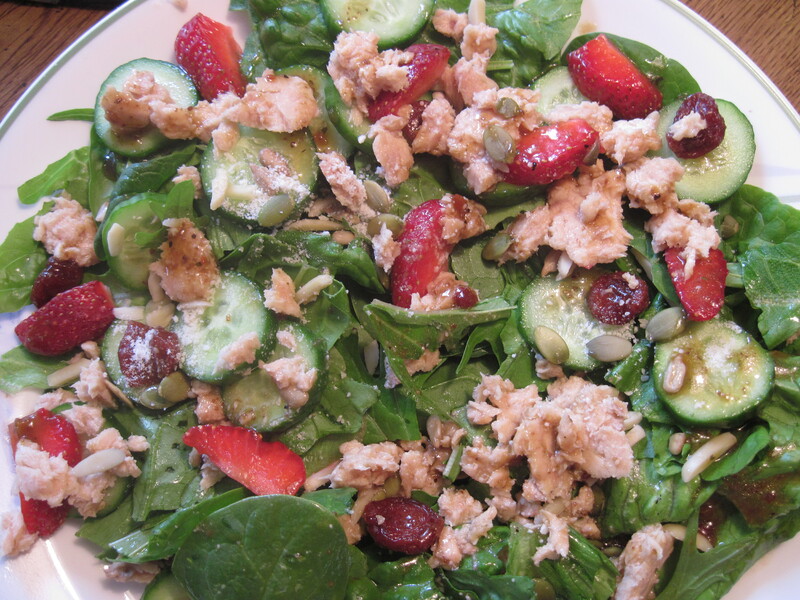 Wash and pat dry a mix of salad greens such as romaine, spinach, arugula, radicchio, or any combination you like. Now the tasty fun begins. Add any or all of the following to make a plain salad a satisfying main dish: sliced cucumbers, olives, shredded carrots, dried cherries or cranberries, sliced strawberries, blueberries, or grapes. Add toasted, slivered almonds or walnuts, sunflower seeds, pumpkin seeds, and grated Parmesan cheese (or any cheese of your choice). If you’re a vegetarian, you can stop here. The photo version has a packet of salmon on top. I’ve eaten it with shredded chicken or tuna as well. ANY leftover meat works well. Sprinkle with your favorite dressing – I used a raspberry balsamic with olive oil – and serve with breadsticks or garlic toast and you will get rave reviews. Another GREEN food treat that is fun and easy for kids to make is KALE CHIPS. Check the recipe section of this blog for the recipe. Stay tuned for some kid-friendly gardening tips to make things turn green in your own backyard. There is a lot of happiness in this post. You can see it and feel it. I hope it rubs off on all of you. I’ve decided whenever I feel down, I am going to look at this picture, because it just makes me feel so happy. Welcome to Middle Grade March:Check out my Interview! Welcome to Middle Grade March 2014. 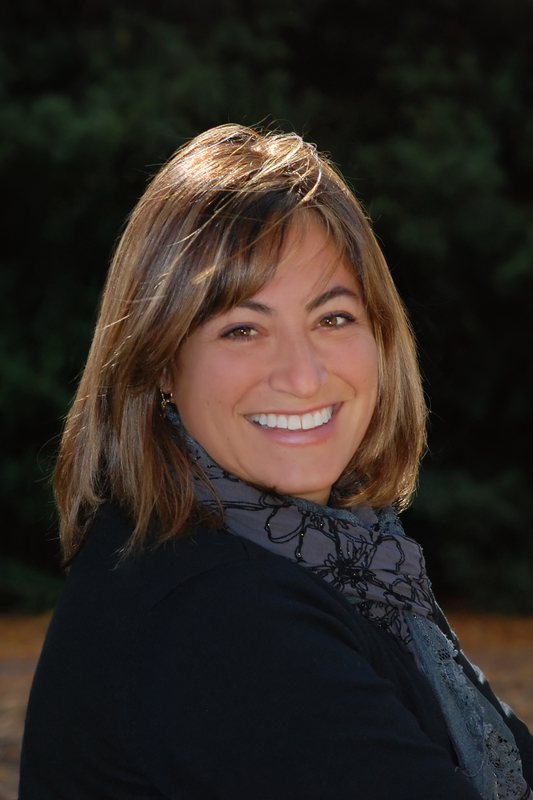 Today I am highlighting Deb Marshall’s new blog about all things Middle Grade. She’s already featured Holly Schindler and her wonderful book THE JUNCTION OF SUNSHINE AND LUCKY, some great book reviews. My interview about writing Historical Fiction appeared yesterday, March 15.I couldn’t be more thrilled and hope you’ll check it out! This is a blog started by Deb Marshall & Akossiwa Ketoglo to celebrate middle grade literature, all month, starting March 1, 2014. This is a continuation of Jill @ The Owl‘s original March of Middle Grade Books. Expect fun and informative interviews, book reviews, giveaways and all sorts of fun shenanigans.